Truly love this. Well worth the money. I have a Boxer/Bull Mastiff and it is so easy giving her a bath now. Happy. Easy to assemble. We love it. The Home Pet Spa makes bath time a lot easier than the tub. We just put it in our kitchen. We really like this tub. Sturdy, good drainage system. Our golden retrievers fit perfectly inside and there is enough room, when they are inside, to move around and wash/rinse them well. Works great even though my dogs are 2 different sizes. I got the shelf which I install for the smaller Cocker Spaniel. The dogs are locked in place by two chains provided which you put through their collar and clip back on the mount. The splash guard keeps the dog from spraying the soap everywhere when he shakes. The removable splash guard is really a nice feature, and the wheels make it easy to move the unit into storage when I'm not using it. 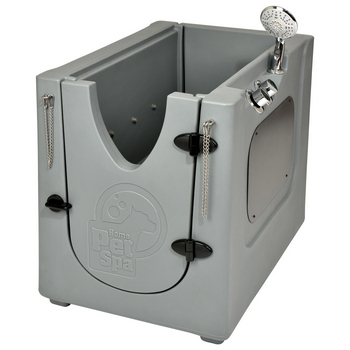 We love the independently controlled jets along with the removable shelf for the smaller dogs. The Home Pet Spa is a great product and will help our business tremendously.